Covering all of the 12 Sandstone crags in the south east of England which climbing is permitted or accessible. 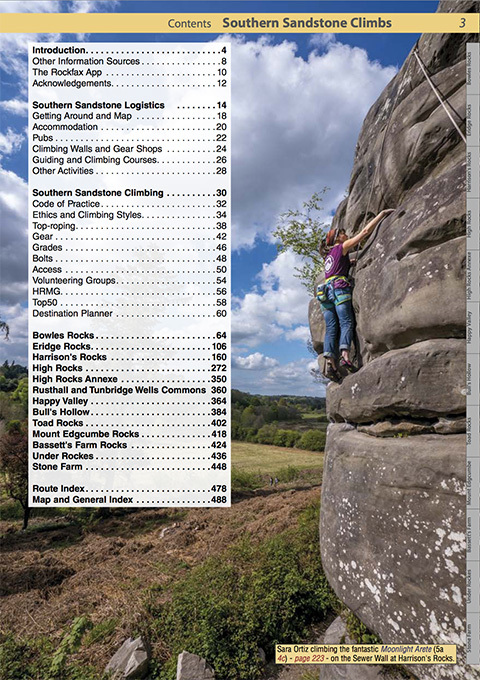 488 full colour pages including a comprehensive introduction to sandstone climbing and the surrounding area. 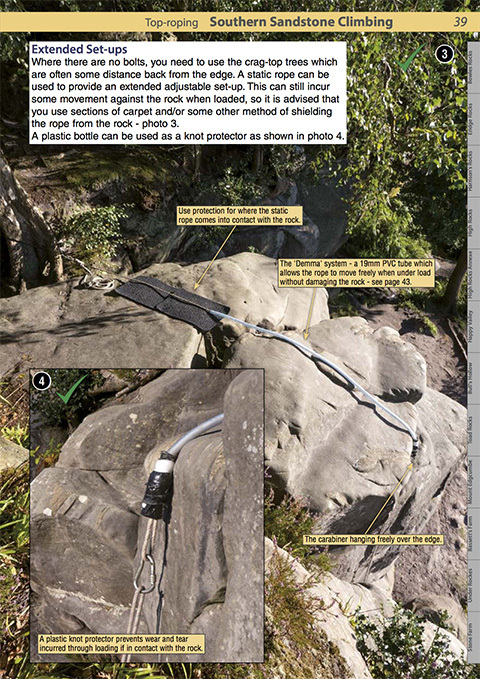 This guide has the most up-to-date guide coverage of all routes and boulder specific problems found on the outcrops. 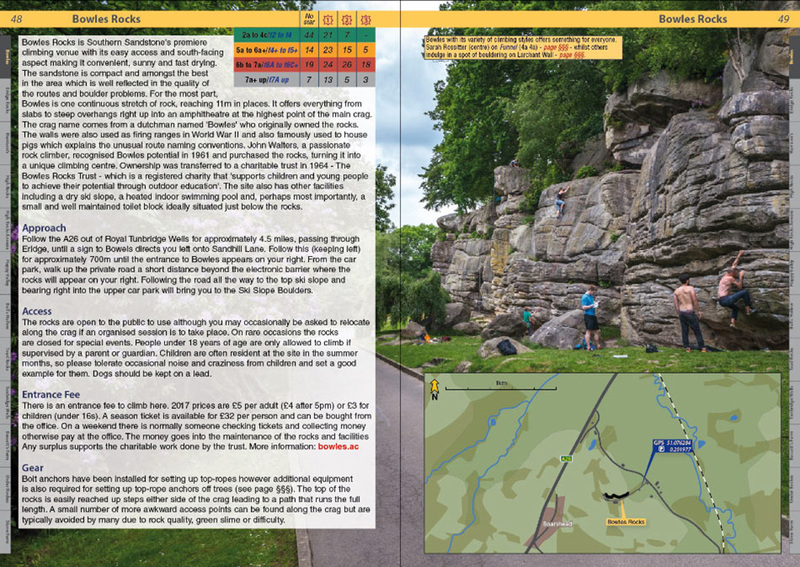 Using the familiar Rockfax style of big-topos, clear descriptions and inspiring action photographs, it is the first sandstone guide to incorporate the French sport grading system, alongside the traditional UK tech grade. Route grades span from French 3a to 8a+. Boulder problems span from font 2 to f8B. Detailed maps and aerial overviews feature throughout the guide, with a detailed photographic introduction about the Code of Practice, gear required and how to set-up equipment correctly. Bowles Rocks - Expanded coverage featuring new routes, boulder problems and a brand new unearthed area! 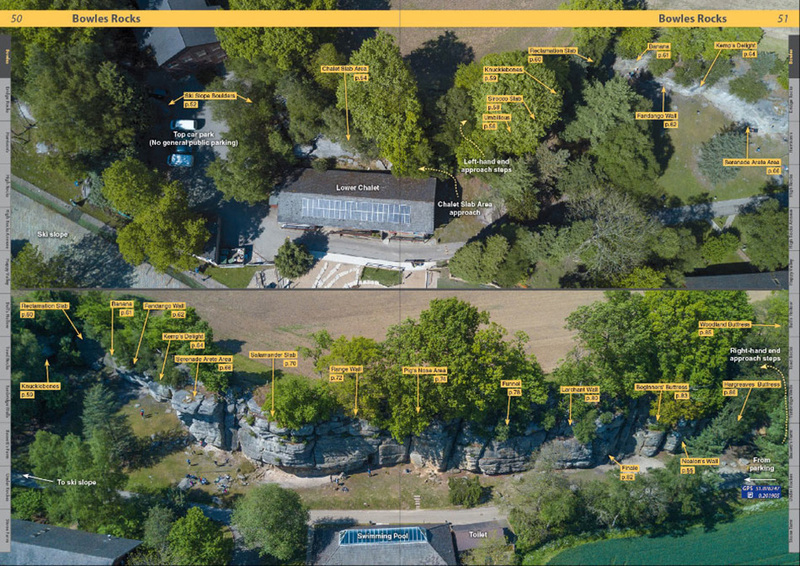 Eridge Rocks - Expanded topo coverage of Eridge South with up-to-date information and new boulder problems across the area. Harrison's Rocks - Extensive up-to-date topographical information and new routes with aerial views. 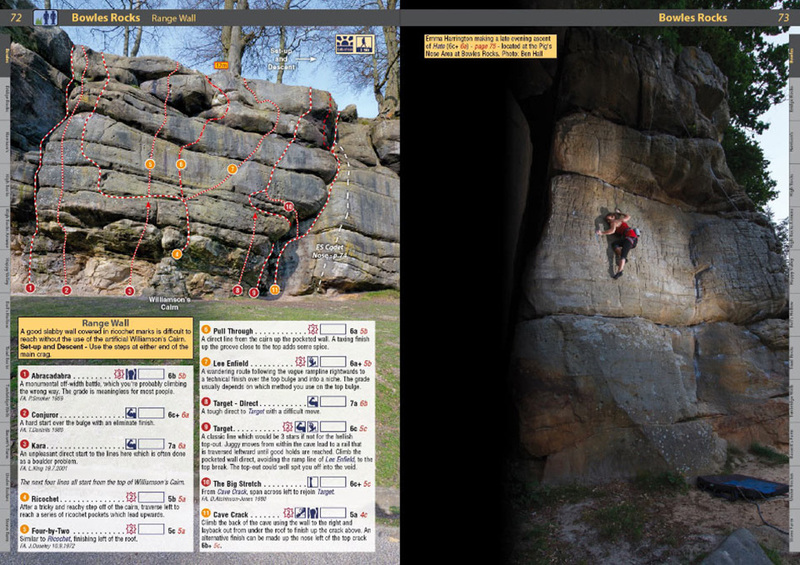 High Rocks - Expanded coverage with detailed mapping and new routes and boulder problems. High Rocks Annexe - Full colour topo and in-depth descriptions of this great venue favoured by highballers. Happy Valley - Expanded coverage featuring the often overlooked but excellent West Valley Boulders and featuring a number of new boulder problems. 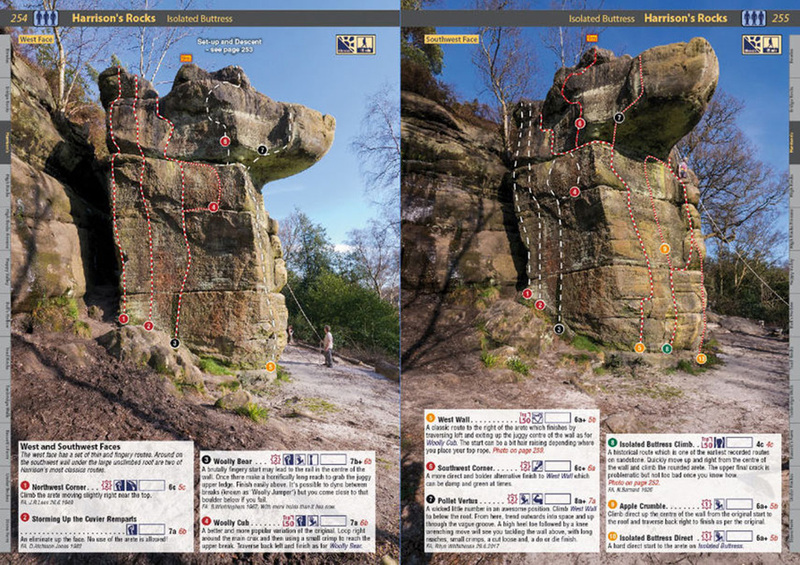 Bull's Hollow - Expanded coverage of this esoteric gem located within an 18th century quarry, with new routes and boulder problems. Toad Rocks - Featuring for the first time in print and app form. Toad Rocks is now fully topo-ed, bringing to light and establishing dozens of unique micro-problems. Mount Edgcumbe Rocks - New Crag! Featuring here for the first time with a number of test pieces for the more experienced boulderer. Bassett's Farm Rocks - Expanded topographical coverage of this hidden gem situated within the beautiful Kentish countryside. Under Rockes - Clear topographical coverage of one of sandstones more remote and much loved hidden venues. Stone Farm - Closest crag to London overlooking glorious countryside and the Weir Wood Reservoir. Clear and expanded coverage of this BMC owned crag. The sandstone presents many unique features – strenuous honeycomb walls, crimpy technical masterpieces, tenuous stretches on rounded breaks, thuggy struggles up cracks, powerful pulls over bulging roofs and some of the most interesting off-width and chimney climbs in the country. Whatever your style, there should be something to suit here. Rockfax is the first sandstone guide to incorporate the French sport grading system. Grades have always been a contentious issue on sandstone. For years, the standard method has been to give each route a single UK technical grade, which aims to give an indication of the hardest move on a route. This works to an extent, but can give a false impression of how difficult a climb actually is overall - a route with one UK6a move has the same grade as one with six UK6a moves without a rest, yet one is obviously harder than the other. Another problem is that historically the UK technical grade has become very limited at the top end with a huge variation in difficulty within some of the top UK6a, 6b and 6c grade bands. This stands out where UK technical grade 6b spans French sport grades from 7a to 8a! This guide has been a passionate and time-consuming project spanning five years. 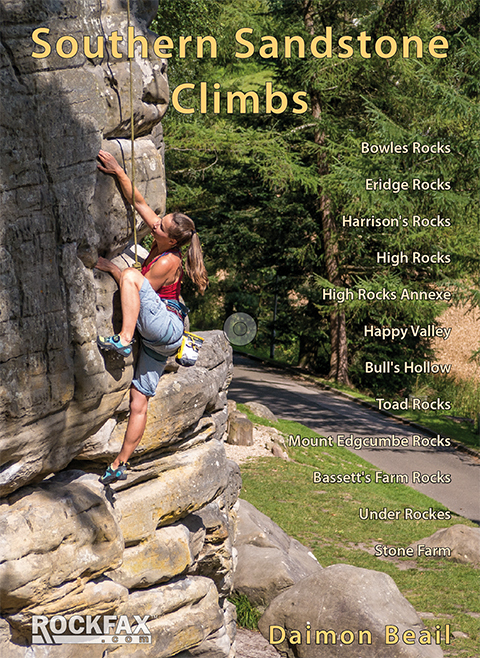 The aim has been to produce a book expanding coverage of the area and being worthy of Southern Sandstone's unique climbing environment, while stressing the importance of the special conservation requirements. 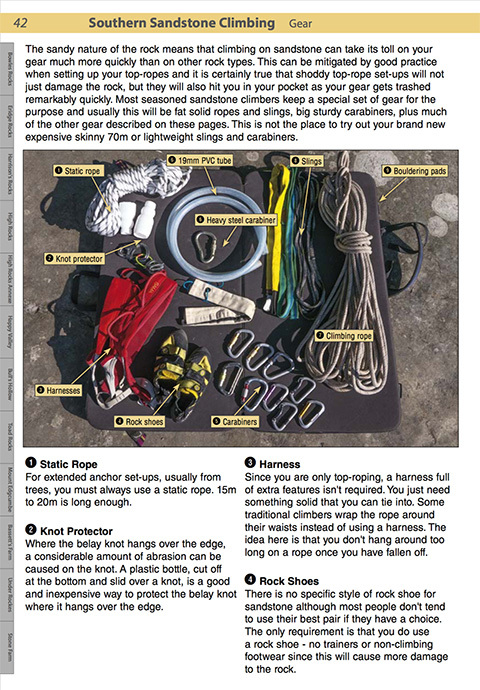 The guide has been written and produced by local climber Daimon Beail. Click here for the introduction chapter. Click here for Bassett's Farm Rocks chapter. Click here for guide book corrections. Buy direct from Rockfax (Rockfax makes a donation from each copy sold from their website to the BMC Access and Conservation Trust), or buy from any good climbing store. Read Tom Gore's UKC Review here. Read 2017/2018 reading recommendation here.